Everyone dreams of flying and, with Photoshop, you can make it happen. 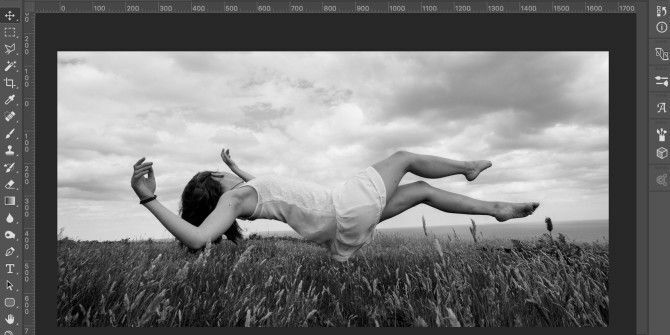 Creating a levitation image is almost a rite of passage for anyone learning to use Photoshop’s powerful tools. You have to combine some clever photography with all your Photoshop knowledge to create a final image that works. In this article I’m going to look at exactly how to do it. You can see me work through my levitation image in the screencast below, and read on to see exactly how I did it. A background plate with no model in it. A photo of the model supporting themselves as if they’re floating using two objects; one under their back and one under one of their feet. I used a stool and a ladder. A plate of the model sitting with their feet in the air. You can see the three images I’m using below. The first step is to prepare everything. You should have shot the images in RAW How and Why to Shoot RAW Photos on Android How and Why to Shoot RAW Photos on Android If you really want the best quality smartphone photos, you'll want to shoot in RAW. Read More so open them up in Lightroom and edit the image of the model. You want to create a nice neutral exposure because you’ll do most of the real editing in Photoshop. Once you’ve got the model photo looking good, sync the edit settings 3 Reasons All Photographers Should be Using Adobe Lightroom 3 Reasons All Photographers Should be Using Adobe Lightroom A lot of people aren't quite sure where Lightroom fits into things. It's an image editor… but it's not as good as Photoshop? Here's everything explained. Read More to the other two images by selecting all three images, and clicking Sync. Next, select Photo > Edit In > Open as Layers in Photoshop to open the three images as a layer stack in Photoshop. Rearrange the layers so the base plate is on the bottom, followed by the model plate and the model’s feet. It’s also a good idea to name the layers. Select all three layers and go to Edit > Auto-Align Layers and click OK. Photoshop will reposition and transform the layers so they align better. Even with the camera locked down, the odds are that there will be slight differences between each shot. Now it’s time to start the real work. The most important part of the process is cleanly masking the model away from the two support objects. The image won’t work if you don’t do it well. The best way to get a good selection is with the Pen tool. Zoom in to 100% and slowly create a path along the edge where the model’s back meets the stool. Draw the path around the rest of the stool, close the path, and then click Make Selection. Feather the selection by 2px and then click OK. Right now, you’ve selected the stool. Instead, you want to select everything but the stool so use the keyboard shortcut Command or Control + Shift + I to invert the selection. Click the Layer Mask button and watch the stool vanish! If the mask isn’t perfect — and it probably won’t be — grab the Brush tool and tweak the mask with a nice soft edged brush with a low flow. Make sure all the edges between the model plate and the background plate blend nicely. While it’s relatively easy to make it look like the model’s back is floating, it’s far harder to make it look like their foot isn’t supporting any weight. The best solution I’ve found is to just composite in a fresh foot rather than trying to make the other one look good. Select the foot plate and draw a rough selection around the foot you want to use. Duplicate it to a new layer with the keyboard shortcut Command or Control + J. You can delete or hide the full foot plate. Lower the foot layer’s Opacity to around 60% and use the Move and Transform tools to position it so that it aligns with the existing foot. Bring the Opacity back to 100% and hide the layer for now. Next, create a selection around the unwanted foot and support object on the model plate — in my case, the ladder. You don’t have to be too careful here. Mask out the selection and, with the Brush tool, tweak the edges so the model plate and background plate blend together. Unhide the foot layer and add a layer mask. Fill it with black and then paint white to reveal the foot. Blend the new foot over the existing one. You can see me work through the process in the video at the top of this post. Once you’ve removed the second support object and replaced the foot, the model should look like they’re levitating. All that’s left to do now is make some final tweaks to the image. With the compositing done, the hard part is over. Now you just have to edit the image Serious About Photography? You Should be Editing Your Images Serious About Photography? You Should be Editing Your Images Editing your digital images is an important step in any good photo workflow. Taking pictures doesn't end when you press the shutter button; it ends when the final image is printed. Read More so that it looks great. Add a few curves layers to adjust brightness and contrast How to Brighten and Add Contrast to a Photo Using Photoshop How to Brighten and Add Contrast to a Photo Using Photoshop Any time you edit an image, you're almost certainly going to need to adjust the overall brightness and contrast. Luckily, Photoshop has some fantastic tools to help you. Read More . Fix any existing color problems How to Correct Common Color Problems in Photoshop How to Correct Common Color Problems in Photoshop Having to fix color problems is one of the most common edits you'll need to do in photography. Digital images just don't look good straight out of a camera. Read More and consider getting creative. For my levitation image, I brightened things up, added a lot of contrast and a vignette, and, although I considered a few color toning options, decided it looked best in black and white. You can do as much or as little as you like with yours. Creating cool images in Photoshop is surprisingly easy. Once you start to get a hang of the basic techniques of creating selections and masks, there’s very little you can’t do. On MakeUseOf alone, I’ve showed you how to use the same techniques to add a ghost to your profile picture Add a Ghost to Your Facebook Profile Picture Add a Ghost to Your Facebook Profile Picture With Halloween coming up, now is the perfect time to freak out your friends by adding a ghost to your profile picture. Read More , create a freaky graveyard photo Use this Photoshop Tutorial to Freak Out Your Friends with Ghosts Use this Photoshop Tutorial to Freak Out Your Friends with Ghosts With Halloween on the way, now is the time to start sharing spooky photos on Facebook. Here's how to freak out your friends! Read More , turn yourself into one of the undead Make a Creepy Facebook Profile Picture with this Free Photoshop Template Make a Creepy Facebook Profile Picture with this Free Photoshop Template Halloween is coming up so it's time to change your Facebook profile picture to something spooky. We show you how with a selfie, a skull, and Photoshop. Read More , and even make it look like a crazy killer doll is attacking you Create a Crazy Killer Doll Image with This Photoshop Tutorial Create a Crazy Killer Doll Image with This Photoshop Tutorial Want to create awesome composite images? We should you how with this easy-to-follow free Photoshop tutorial. Read More . If you follow my technique and make your own levitation photo I’d love to see it. Feel free to share your work, or ask any questions, in the comments below.